For the next few months, we will be featuring weekly interviews with our instructors for the upcoming Weaving Kind Makerie on October 19-22, 2017. We are so proud to have these incredible people joining us, and are excited to give you a glimpse into each of their creative worlds. 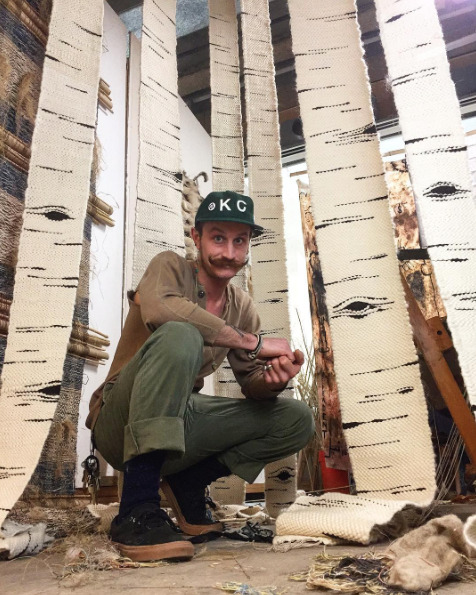 Neil Goss is a fiber artist, ceramicist, natural dyer and weaving teacher from Lawrence, Kansas. His work is a collaboration with and for the earth, using natural dyes, fibers and foraged materials. He gravitates toward large-scale installation pieces, often leaving them to change and decay as a part of the landscape. I had the pleasure of meeting Neil at a mini weaving retreat I organized in Colorado. Hanging out with him inspired and challenged me to be a more purposeful weaver and a more purposeful human. I think what I admire most about Neil is the way he is able to honor the past and be mindful of the future while staying fully engaged with the present. You'll have the opportunity to learn from Neil as he teaches the ancient art of backstrap weaving at The Weaving Kind Makerie! His work can be found at neilgoss.com and on Instagram as @backstrapweaver. Why are you a weaver? Was there a single moment or experience that was the catalyst, or was it a slowly-unfolding process? I am a weaver because I thought I wanted to be a fashion designer. It all started early in highschool when my brother suggested that I take a Home-Ec sewing class to meet cute girls. I didn't meet any cute girls, but I did fall in love with textiles through clothing and quiltmaking. At that time I wanted to learn fashion design, so I took the steps to enter KU’s Textile Department. My first summer there I took two classes, one in screen printing and the other in weaving. I found out very quickly that I highly preferred weaving. The number system eased my OCD by focusing it upon the sequences and workings of the loom. The immaculate beauty of so many individuals (the warp threads) being united by one thread (the weft) stuck with me and represented so many facets of life that I was hooked. Weaving also cured my arachnophobia. I grew up being very scared of spiders. However, when I learned to weave I developed the highest level of admiration for spiders as weavers and lost my fear of them. I respect spiders more than I respect any human weaver. Talk a little bit about why your work often embraces the idea of change and decay. The decay and breakdown in my ephemeral works originally rooted in my work during college. Many of my peers were making “art” for the grade and then throwing the work in the trash. It struck a chord in me and made me think about what impact my work would have on the Earth, positive or negative. I started using natural materials that were biodegradable and environmentally friendly. That’s when I started using hemp, wool, and other purchased and foraged natural materials. In the beginning it started as a way to embrace decay and to give a chance to be seen as beautiful. Humans often go to extreme measures to ensure that certain things don’t break down or decay, including themselves. I wanted to challenge that notion by presenting decay as natural and beautiful while displaying the birth, life and death of the work. It all mirrors life. Later on my wife and I were discussing the connections between natural dye plants and medicinal plants (most natural dyes and are also herbal medicine and vice-versa). Monica is an herbalist, artist and so many other amazing things. Together we developed our Medicinal Art concept, which offers work to the Earth with the intention to heal or pay respect. Our concept was inspired by Ayurvastra, a branch of Ayurveda, where your clothing, bedsheets, etc. are dyed with medicinal dyes. We backstrap weave with hemp, wool and alpaca yarn that has been naturally dyed with medicinal plants. Other foraged/borrowed materials are used and included in the works. Participants and passerbys are welcome to join and assist. The piece is then offered back to the Earth by being installed onsite. As the piece is weathered over time by the elements, its colors begin to fade and the weaving becomes exhausted. These are signs that the Earth is “consuming” the medicine and that the artwork is being reclaimed. This work started out only being for the Earth; we didn’t really have thoughts or concerns about humans since most of what we were doing with the Medicinal Art was in response to the negative results of humans living on Earth. However, we found that almost everyone who encountered us weaving, participated, conversed with us, or witnessed an installation had been left in higher spirits than they were before. So we began to view Medicinal Art as being therapeutic for humans as well. How does it feel to watch your outdoor installations disintegrate? For me, to watch my work decay is incredibly thrilling. You are shown something new everyday as the piece evolves. It is a special and moving thing to see the birth, life and death of something. Depending on what we are talking about, seeing those things can be life-changing. I recently made a connection to my fascination with witnessing the death of my work. I realized that I might be doing it as some way to connect and communicate with my father. Sometimes, I go and view a piece I installed months before and it looks just as strong as the day I hung it. Then I’ll go back the next day and its fallen, been taken by the river, or whatever, but it's gone. That’s how losing my dad was. One day he was fine and the next he was gone. My last words to my dad before he passed were, “good night dad, I love you.” He went to work the next morning like he did every day. I got a call from my mom later on that day while at work. Two seconds on your Instagram will tell any viewer that you’re a staunch feminist. I am a self-proclaimed feminist. I’ve always been more socially comfortable in the presence of women. My father was an incredible human and impacted me greatly. He was a huge part of my life, but since he was the breadwinner my mother was around much more often. My dad died when I was 15. From then on, I was raised by my mother, and the majority of people who helped her raise me were women. Soon after my father passed, my mom had a hysterectomy and I had to take care of her for a good while. Has weaving strengthened your feminism? What is your experience as a man who’s immersed in a craft that tends to attract more women than men, and is historically “women’s work” (or so people think)? Weaving and working in the fiber world has definitely made me more of a feminist. During my time in school, all of my classmates were either females or queer males. It was amazing! Everyone really supported and cared for each other. There were no heavy egos or intense competition. The fiber world is very much so a female/female-identified world that has heavy associations to craft and “woman’s work,” and still fights to be accepted in the “fine art” world. In America, textiles are thought of as woman’s work due to our history; there are lots of males and non-gender conforming individuals that are also rewriting the definitions of textiles and fiber, with women leading the way. It should be noted that, depending on which country you are in, textiles can very much be considered “man’s work.” For instance, in the Peruvian Highlands, knitters are mostly males. Historically in the Asante group in West Africa, only men wove Kente cloth. So for me, fiber and textiles is human work. We all need textiles and fiber to exist and survive comfortably. I do think that textiles in America will always have associations with being “woman’s work” due to our history. From my humble perspective, that is not something negative or shameful. There is nothing shameful or negative about being a woman. It is a sign of the utmost strength. We have a long way to go for the equality and equity of women, people of color, non-Christians, LGBTQIA+ folk, homeless folk, mentally ill folk and so many other individuals here on planet Earth. I believe that we can overcome these hurdles as a species but we have to stand by one another and inform those who don’t tolerate diversity the importance and beauty of diversity. What are your thoughts on the status of weaving within the art world? In regards to the “art vs. craft” conversation and struggle amongst fiber workers, I share my humble opinion. Art and craft can and should intertwined. It is great when they work as individuals, but when you are familiar enough with both to bring them together into one work, magic happens. I challenge weavers and workers of fiber to do more than make beautiful work. My hope is that people take their weaving skills, techniques, and knowledge to the next level to marry their experiences, stories and passions to create work that goes beyond formal beauty. For me, I am first and foremost, an artist. Second, I am a weaver, a dyer, a ceramicist, a forager, a gardener and so many other things. How do you feel when you’re creating work? How do you feel when you have less time to create? I feel right when I’m working and making art. It’s like it is what I am made to do. If I’m not working, I’m thinking about working. It’s one of my greatest strengths and my greatest weaknesses. I’m trying balance things and figure out how to relax but it feels really awkward. When I have less time to create I feel pretty stagnant and worthless. It is very much a part of my mental and physical health to be able to make art. At the same it destroys my mental and physical health, but I’ll take it. How do you stay connected to the earth in a techno-centric culture? Does technology present an internal conflict for you? It’s definitely hard for sure. It helps to live in the country and have that slight distance. I try to stay connected to the earth through gardening, foraging, and learning more about nature and the fascinating workings that go on underneath our toes. Don’t get me wrong, I’m fully submerged in technology like most other people. I would prefer to not have to deal with most technologies but it's hard to avoid in the time we're living in. I choose my battles for sure, and embrace technology as a weakness - I have to get help from friends a lot of the time when doing techy stuff. Sometimes I wish I was a little more "with it" technologically speaking, but I wish I had more time for a lot of things, so I guess it will work itself out. Talk about your experiences teaching backstrap weaving. I love teaching backstrap weaving. It is wholly fulfilling. It doesn’t matter if the student is an experienced weaver or not; something new and exciting is always exchanged. The energy involved around backstrap weaving has existed and been growing for at least 5,000 years. I think people can feel that when they experience the backstrap loom. It is thrilling to know that you can make art with nothing more than some sticks and yarn. Not to mention, you can do it anywhere your body is. I believe that it tends to connect people more deeply to Earth. Despite its primitive technology, one can do highly complex weaves with a backstrap loom. For example, there was an approximately 2,500-year-old Peruvian backstrap loom discovered that had a triple-weave cloth in progress. Most modern floor loom weavers don’t (and wouldn’t want to) do that. Backstrap weaving is a beautiful art form to watch, as well. I have noticed that when I am backstrap weaving in public, people are very inclined to approach. What have you learned through your weaving practice that you want every weaver to experience? Weaving changed me and been a huge part of my life since the first day I did it that summer in college. It's one of those tasks that will overcome you and make you want to do it 24 hours a day. I believe that it has saved a lot people and given them outlets for self-expression and self-reflection that they didn’t know existed prior. I have learned that weaving is a human experience. It transcends culture, ethnicity, race, sexual orientation, gender, religion, class. Much like the Earth, weaving bridges the human gap. Weaving brings people together. Traditionally and ideally, weaving is a community effort that brings everyone together for a common goal. Originally that goal was survival, to reference Emelie Pamela Röndahl, a friend and fellow weaver. Weaving is a foundation to the development of the human species; weavers can feel and respect that energy. Lastly, share some of your current influences (people, things, events, etc). One book that I’ve been reading for the last forever is Jonny Waldman's Rust : The Longest War. It has made an impact on an upcoming body of work that I will be making. My friend and fellow artist, Gina Adams, makes mind-blowing work and she’s always a couple steps ahead of the game. Her work is very multi-faceted but she comments upon her indigenous ancestry and the history of the relationship between Native Americans and the US government. Anything artist and curator, Lynnette Miranda, touches is pure gold. She is a beam of light in the darkness. She makes things happen, provides opportunities to amplify voices, and brings diverse groups of people together. She questions and challenges established conventions through open dialogue and collective knowledge building. Lynnette’s beautiful ability to unite people through art inspires and lifts me daily. Currently, Erin M. Riley is probably my number one inspiration in regards to weaving. It seems like every day she has a new show in a new country and on a new continent. I believe that the work Erin makes is incredibly meaningful, relevant and needed. The craft, concept and execution of the weavings is mind blowing. A recent event that impacted me greatly was the peaceful protest at Standing Rock. It was a beautiful thing to see so many people coming together to stand up and fight with indigenous people against the careless thievery of the United States. I was so elated when the Army Corps of Engineers halted the production of the DAPL but was then crushed when Trump changed everything with the swipe of his pen and not a care in his heart. We have a lot to fight for right now. It is the time to make meaningful and confrontational art. The truth must be told, questions must be presented, and solutions must be offered. Thanks, Neil, for your insight, candor and the intention with which you approach your weaving work. We are so honored to watch as your work unfolds! Stay tuned for an interview with Erin M. Riley, another one of our amazing instructors for The Weaving Kind Makerie!